Located in beautiful Pontiac Cove, Missouri, on the east side of Bull Shoals Lake, Lost Cove Resort is your premier destination for fun on the water! Enjoy the water with sports including world-class fishing, swimming, scuba diving, water skiing and tubing. Rent a boat or launch your own at Pontiac Cove Marina. Spend the night or stay for a week in one of our log cabins. Bring your friends and enjoy a great time on the lake! We have 5 new cedar log cabins with two bedrooms equipped with full kitchens and dishwashers, Weber BBQ pits, a small covered porch with patio furniture, individual fire pits, Satellite Television, Central Heating and Air. There is a queen size bed in each bedroom, a queen size sofa sleeper, and a futon combination couch sleeper in the main living area. 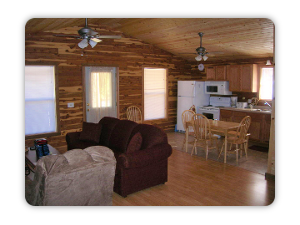 The total area of each our cabins come to almost 768 sq feet. Room for the whole family and your friends. We are pet friendly too! The Pontiac area includes fishing for Large Mouth Bass, Spotted Bass, Small Mouth Bass, Crappie, Walleye, Strippers, and Catfish. You may even have the whole lake to yourself. The White River is a short distance from Lost Cove Resort, and is home to some of the worlds finest trout fishing. Area water sports include water skiing, tubing, knee boarding, wake boarding, swimming or just a leisurely boat ride at sun rise or sunset. Water skiing and tubing is fantastic due to the open waters and many large coves. 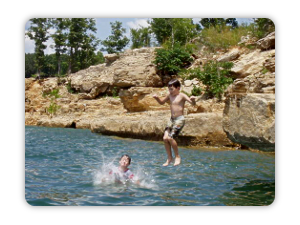 Scuba Diving and Snorkeling is also a favorite past time on Bull shoals. With deep clear water, this is a great place to renew your skills before taking that salt water trip.